Canary wood is the trade name for a number of species of tulip trees in the Liriodendron family that grow in a wide swath of South America. It is characterized by a canary yellow coloration with vivid orange to red striations. This stuff is beautiful. Gearhead side note: Stacy David, from the TV Show Gearz, used Canary wood in the bed of his Copperhead Project. 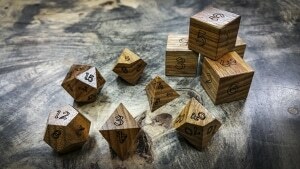 I would like to purchase just a pair of these dice (Standard 6 Sided). Is that possible?